Hydrangea have to be one of the most useful flowers known to man or woman. Not only do they delight in the garden, they dry beautifully, providing exuberant arrangements with little to no effort throughout the non-growing season. 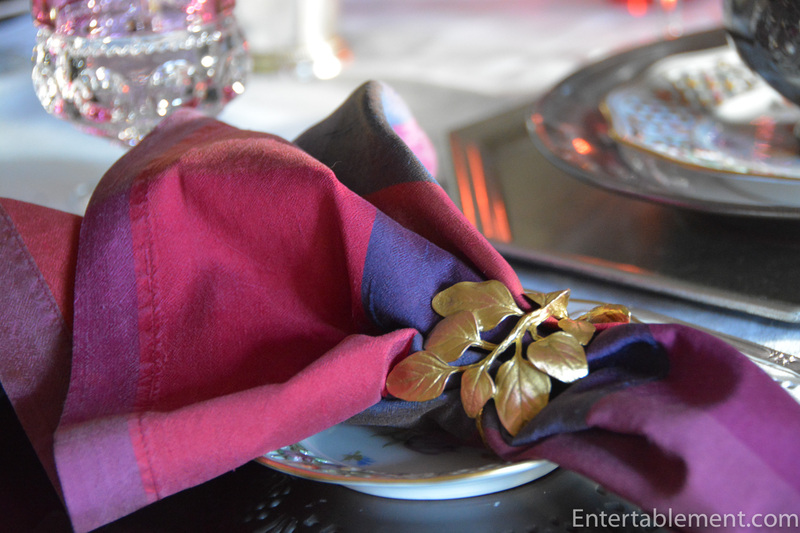 I hosted this dinner late last fall, and thought how perfect the setting would be for a Valentine’s Day dinner: deep cerise napkins. hefty pink tumblers and pink-tipped hydrangea. 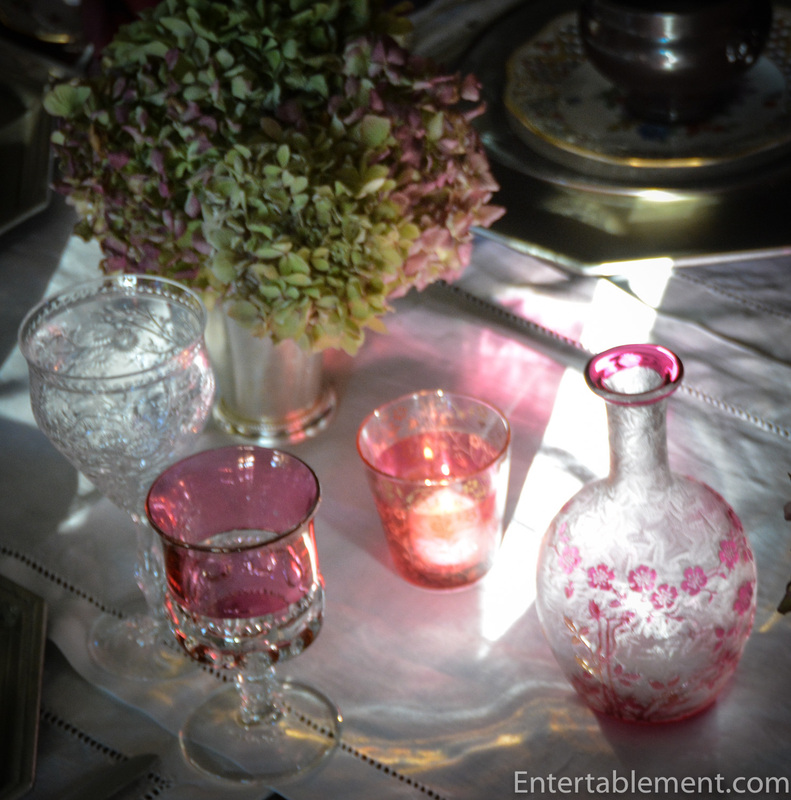 The table setting is a layered combination of antique girly-girly and modern pewter, but it works somehow. Juliska Pewter individual soup tureens top antique Dresden Flower reticulated dessert plates. 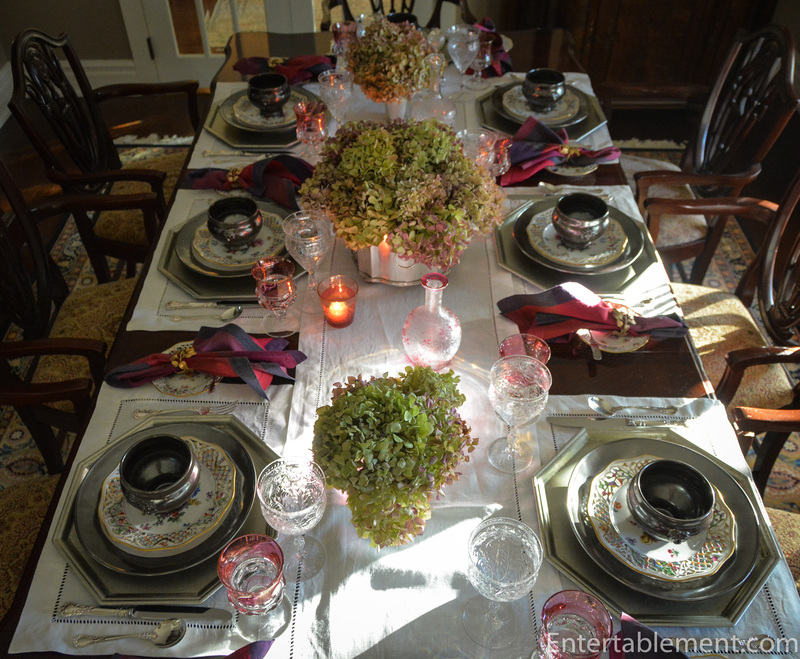 Juliska Emerson Dinner plates sit on top of silver toned octagonal chargers from Pottery Barn several years ago. 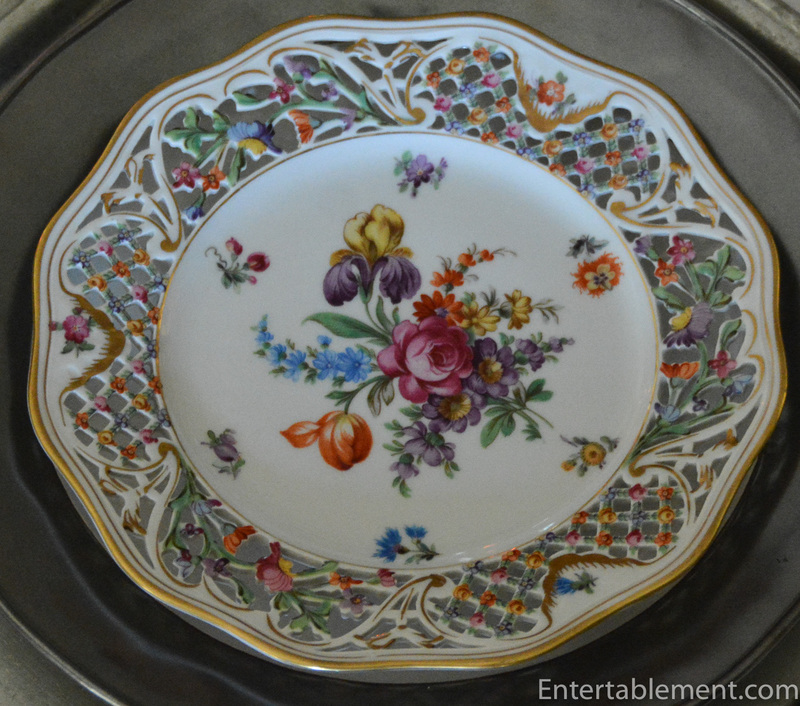 The Dresden Flower dessert plates were among the very first pieces I purchased when I started collecting tableware. They’re not particularly high quality or valuable, but I loved the reticulated edge and vibrant colours. The producer is Schumann, and there are three different patterns, which I think of as “Lily” at the top, “Iris” above and “Pink Fuzzy Flower” below. 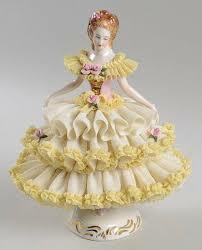 As a child, I remember being fascinated by the finely wrought, elaborate lace ball gowns on Dresden figurines. Remember these? (this picture is from Replacements). 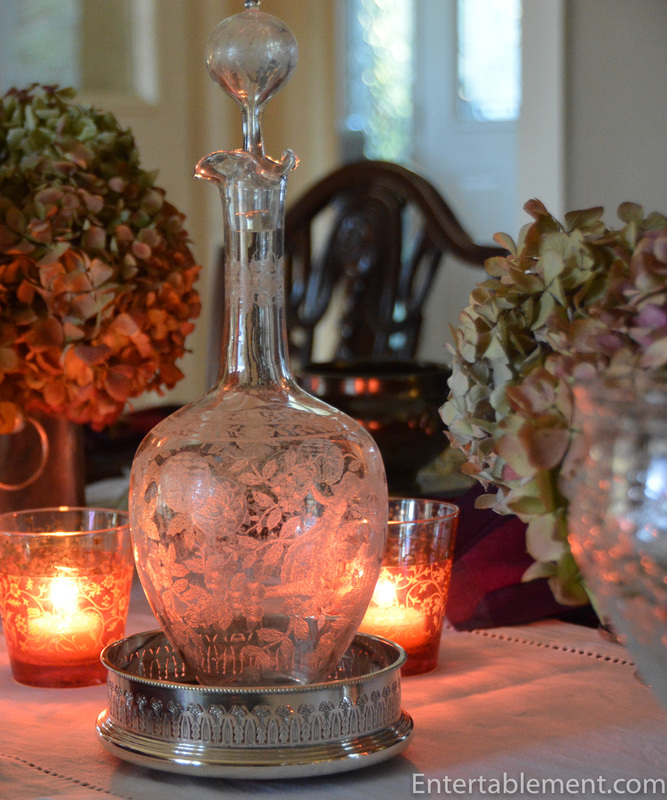 …and a pair of Victorian clear etched-glass decanters with hollow globe stoppers. We use these decanters frequently, although I’m usually careful to move the stopper off to one side before the wine starts flowing. They’re incredibly light and could easily be brushed to the floor by a vigorously gesticulating guest during an expansive moment. 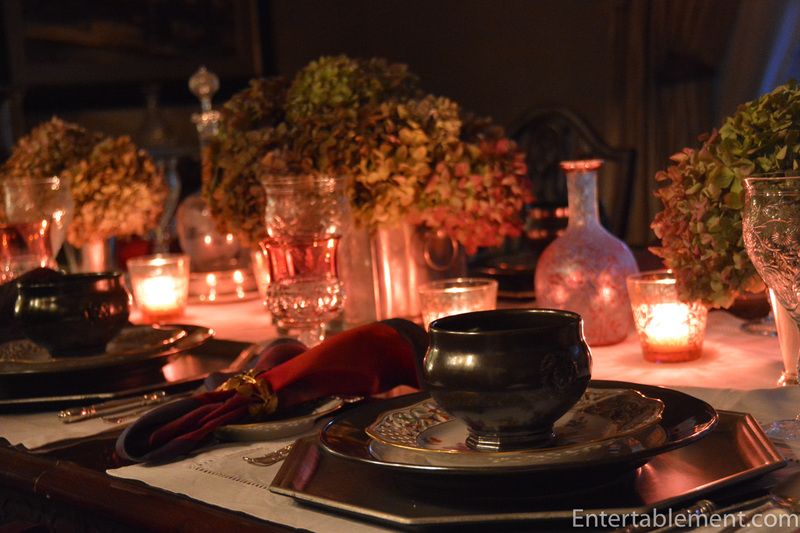 It was a warm, inviting setting with a combination of silver and gold toned accents. 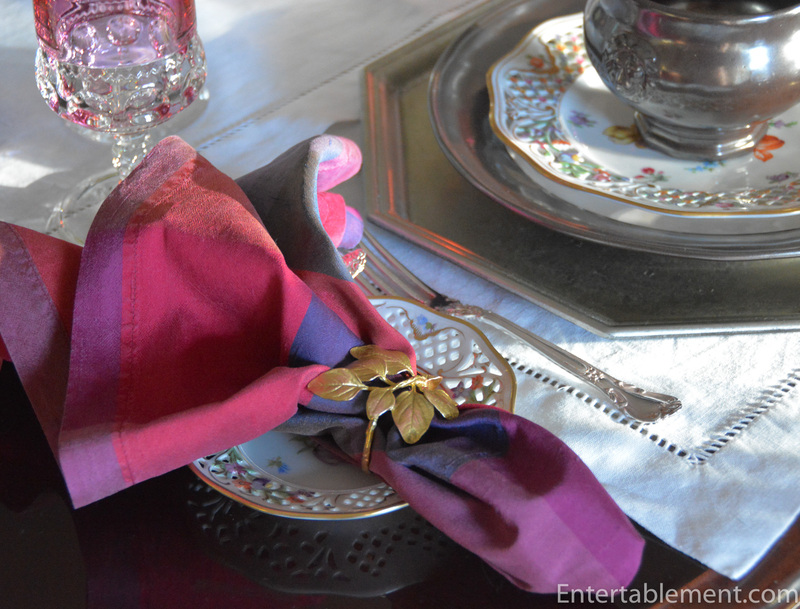 The napkins are multi-coloured checked silk, and were purchased many, many years ago from the now-defunct Country Dining Room Antiques in the Berkshires. I finally figured out that Michael Michaud is the maker of the napkin rings, which I bought eons ago from Chintz & Co. in Victoria, BC. I’ve recently discovered that they are available on eBay or brand new from a lot of retailers. 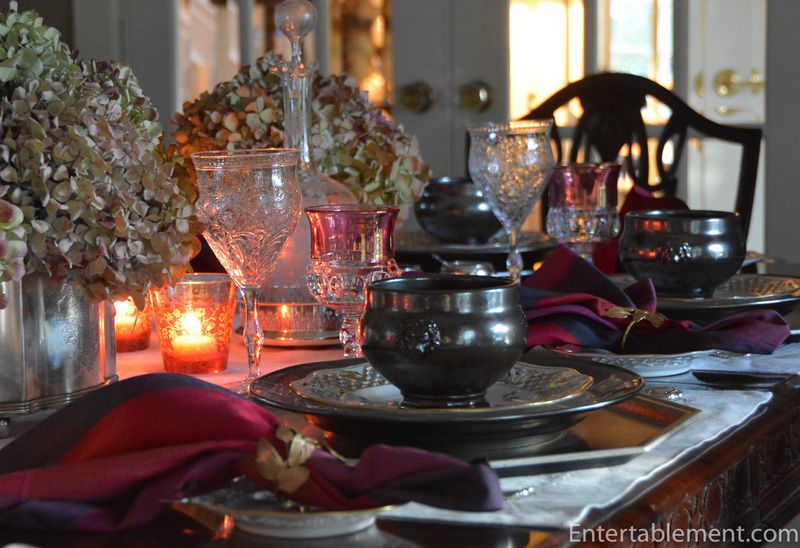 Just google “Michael Michaud”; he makes lots of botanical-themed goods for the table in both gold and silver tones. 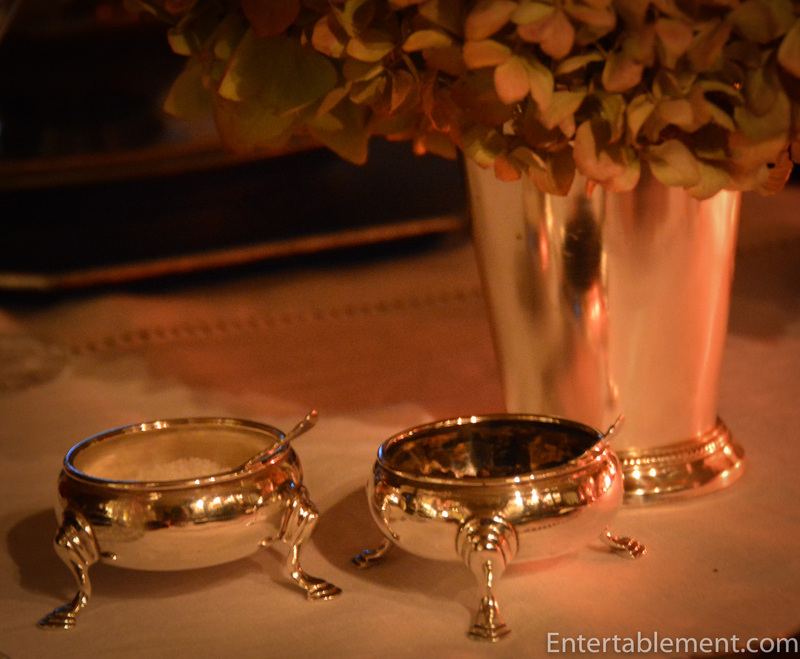 Antique silver open salts and tiny spoons nestle up to modern, silver-plated mint julep cups containing more dried hydrangea. 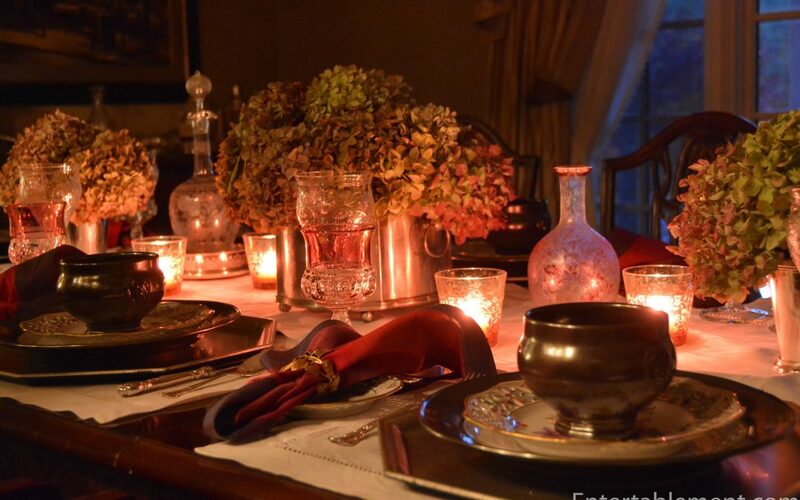 A cozy candlelit dinner is always a welcome way to spend time with good friends, especially on a chilly evening. Happy Valentine’s Day this week! I have 12 dinner plates that have the same design as the dessert plates: 4 each of the 3 patterns. Can you tell me any more about them? The back of the plate has a crown Bavaria V 10 stamped on it. Sorry for the delayed response; we’ve had a domestic crisis with one of the pets and I’ve been largely offline for a couple of days. I did some digging around and it seems the pattern we both have is called “Chateau Dresden” by Replacements. 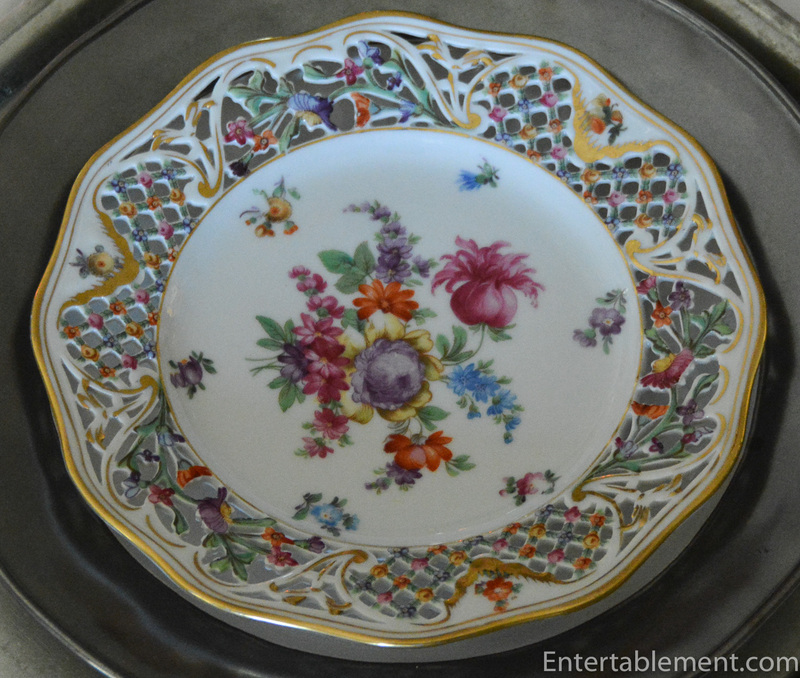 The solid rim version, quite similar, is called “Empress Dresden Flowers”. They note the production dates as 1945 to 1963, which seems about right. There is quite a bit available on eBay and often called “Dresden Flowers”, which is the name I got for it when I bought it at an antique dealers many moons ago. 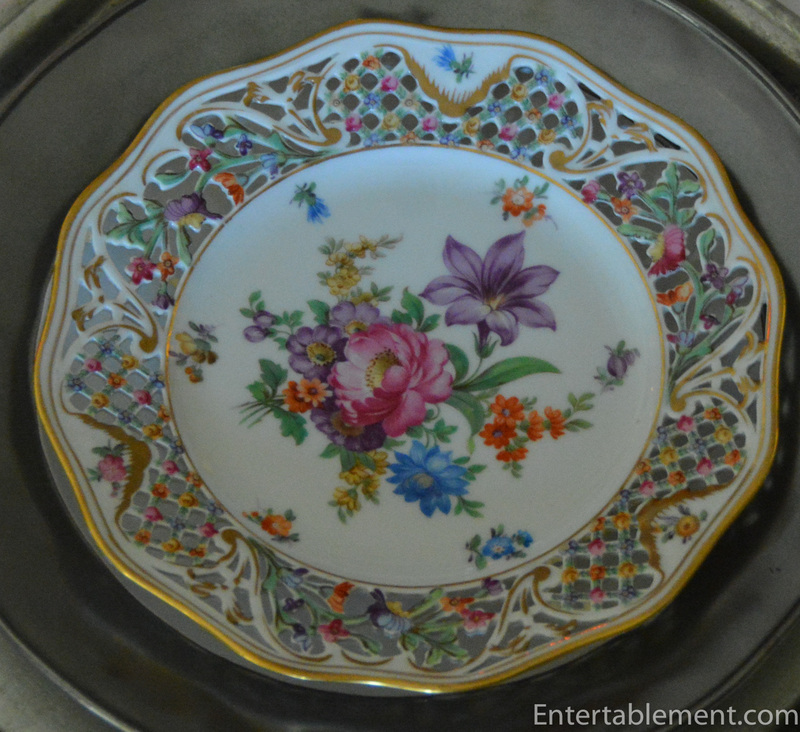 There seems to be a few more central floral motifs for the dinner and luncheon plates, one with a tulip, one with some quite lovely bi-coloured purple & yellow flower (kind of an iris crossed with a peony…). I have some of the footed compotes, a set of tea, coffee and chocolate pots with cream & sugar and some demitasse & small tea cups, as well as a big centrepiece which I often use for flowers. Not the most precious or rare of vintage sets, but I do love it, as I’m sure you do, too! Lots of pretty on this table. Of course the open salts are a favorite. 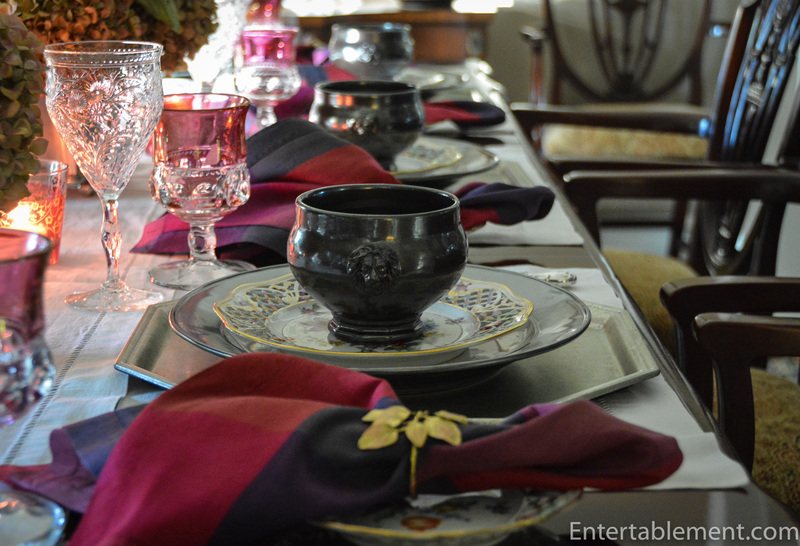 The soup tureens are amazing and the chosen glasses compliment each other and the decanter nicely. I like the different shapes of the plates and chargers in the stack. Nice! 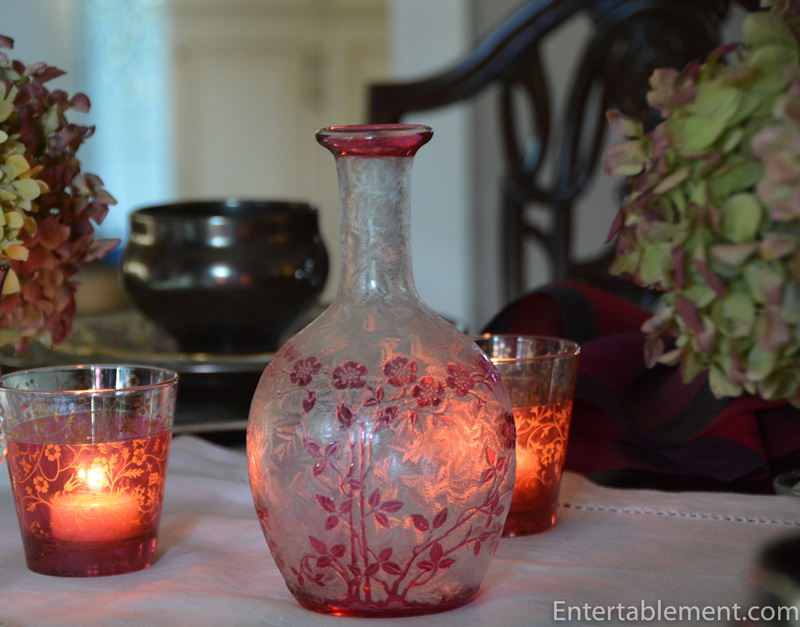 It’s a fun, girly table, yes? So Valentineish, if that’s a word, even though it was late fall! I do like Juliska’s pewter stoneware. It really does look like pewter, but so much easier to care for (and safer for food). Have a good rest of the week. I hope you have a good Valentine’s Day!